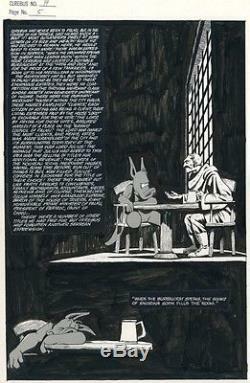 Offered here is an original early Cerebus page by Dave Sim, page 5 from issue 14. This one is a nice 3/4 splash with lots of atmosphere. This is an excellent example of Sim transitioning away from his Barry Smith style of illustration. Most early Cerebus pages are locked away in collections and these are getting scarcer every day. The item "Early CEREBUS original comic art splash page Bronze Age DAVE SIM barry smith" is in sale since Tuesday, April 25, 2017. This item is in the category "Collectibles\Comics\Original Comic Art\Splash Pages". The seller is "bryter-later" and is located in New York, New York. This item can be shipped worldwide.